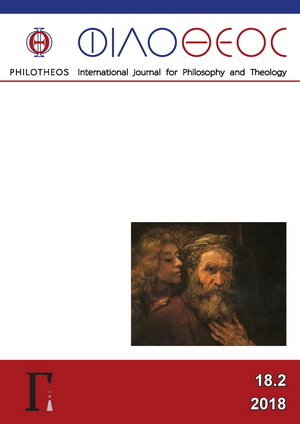 Philotheos is an international scholarly journal that publishes articles and book reviews in the fields of philosophy and theology, focusing on the issues in which the two intersect from antiquity to the present day. It is published both in electronic and print formats. The submitted article manuscripts are subject to double blind peer review process. Two reports are ensured for each submission. Book reviews will not be sent to referees, but reviewed directly by the editors. Article manuscripts should not exceed 60.000 characters (including spaces) and the book reviews should not exceed 6000 characters (including spaces). In special cases longer submissions may be taken into consideration. Manuscripts should be sent as a .doc file to the following email address: editor.philotheos@gnomon.rs. The email should contain author’s name and affiliation. We welcome contributions that are written in English, French or German. Depending on the topic, manuscripts written in other European languages might be accepted as well. The journal only accepts original manuscripts that have not been previously published and are not currently under consideration for publication elsewhere. By submitting to Philotheos the author certifies that the manuscript is the author’s own work, has not been simultaneously submitted to another journal, and has not been previously published. List of references. Titles not written in Latin script should be transliterated. For Slavic languages contributors are advised to adhere to the following international system: Scientific transliteration of Cyrillic; ALA-LC transliteration guidelines should be observed in all other cases. Authors should remove their name and any identifying information from the manuscript. The file properties should also be anonymized (the Document Inspector feature in Word can help remove hidden data and any personal information attached to the document). All the references should be formatted according to the Chicago Manual of Style 16th edition or above (Chicago: Chicago University Press, 2010). A helpful resource on The Chicago Manual of Style is available here.